Try something unique for your special day! Kombis4u is a fully accredited local Adelaide owner operated hire company with a special focus: connecting you directly with the magic and nostalgia that is a split window Kombi. The VW Kombi is a stylish, timeless and fun way to travel and we have provided a high level of customer service since we began in 2010. We want to help you make your special day as exclusive as possible and what better way than to have our chauffeur driven fully renovated Kombis to give your occasion a special lift. It seems everyone you meet has a personal connection to a Kombi â€“ there is always a story to tell about a car that was part of their childhood or a fun part of their mis-spent youth. But sadly not everyone can have one. And that is where we come in. At Kombis4u we own and maintain our own Kombis so that we can guarantee you a consistently high quality service and vehicle. 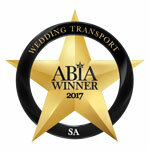 Kombis4u are very proud to have been voted Best Wedding Transport in South Australia at the 2014 and 2017 ABIA Awards by our Brides and Grooms. 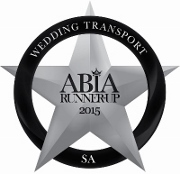 2015 Runner-up Wedding Transport SA, 2016 Finalist- ABIA Wedding Industry Awards.